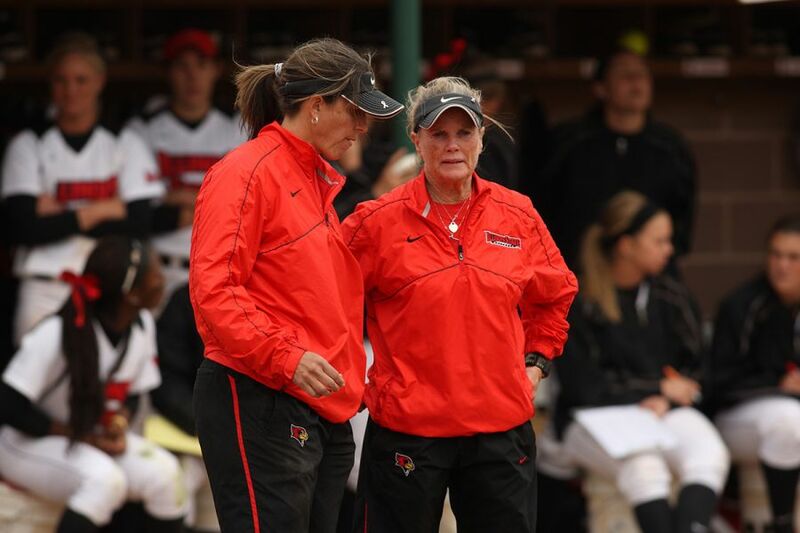 Redbird softball coach Melinda Fischer during a game in the 2013 season. When you’ve led the Redbirds to 900 wins, you might think the games would all kind of blend together. Not for Melinda Fischer ’72, M.S. ’75. Give her a minute to think about it, and the veteran Redbird softball coach says she can recall distinct moments from each victory—from the way her team’s bats exploded for 16 hits last season against Southern to win the Missouri Valley Conference title, to the chilly doubleheader against Bradley this month that led to Fischer’s 900th victory with the Redbirds. Fischer is now in her 28th season with Illinois State, and her 907-609-4 record at ISU makes her the winningest coach in school history. But Fischer, who went from playing softball on the Pekin playgrounds to the Redbirds Athletics hall of fame, is the first to tell you that it’s a team sport, 100 percent. And she’s proud of her 900+ ISU wins, and is grateful to have the one thing many college coaches do not—longevity. 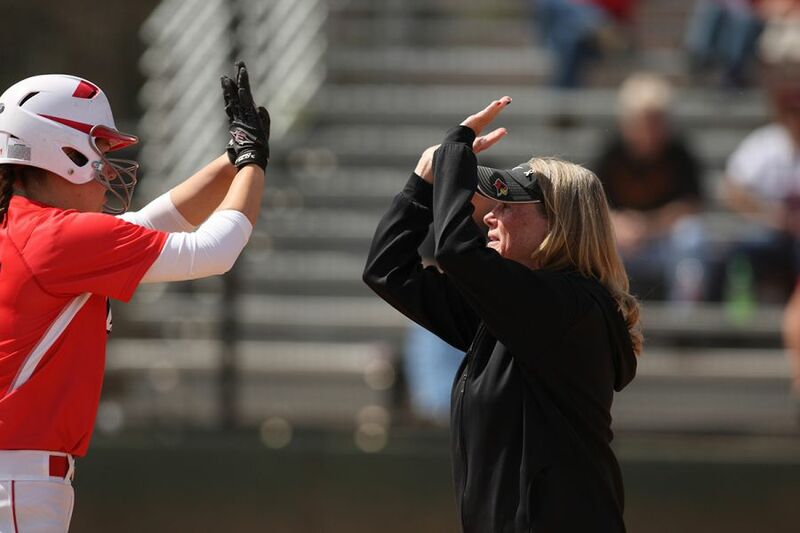 Redbird softball coach Melinda Fischer high-fives a player during a game this season. She heeded the advice and became a three-sport Redbird athlete—field hockey in the fall, basketball in the winter, softball in the spring. The shortstop-turned-third baseman helped lead the Redbirds to the 1969 Women’s College World Series, where they finished second. “I just felt it. You just know when it’s right, and it felt right,” Fischer said of college coaching. She picked up some more basketball and softball coaching experience during a two-year stint at Eastern Illinois before coming home to ISU in the early 1980s. She spent five years coaching the women’s basketball team alongside her own former coach, Jill Hutchison, another Hall of Famer. “That was an amazing dream come true,” Fischer said. Fischer took over as head softball coach in 1986. In her 28 seasons at Illinois State, her teams have won a combined nine Missouri Valley Conference and Gateway Athletic Conference regular-season championships. The team’s NCAA Tournament berth in 2012 was the third-straight for ISU—a first for the program. As for recent games, that 2012 MVC title-winner over Southern Illinois stands out, Fischer says. The team has earned at-large NCAA Tournament bids—thanks in large part, Fischer says, to the University supporting her push for a tough early-season schedule—but the conference crown proved elusive. Many of the big hitters and defensive standouts from the 2012 team returned for this season, which has been a challenging one because of repeated rain-outs. Fischer’s team is 24-18 (9-6 in MVC play) headed into this weekend’s home stand against Northern Iowa, with Senior Day and Fan Appreciation Day set for Sunday. Players today are a little different than the ones Fischer first encountered in the 1980s, now that three-sport athletes are a rarity and experience with specialized pitching and hitting coaches is commonplace. But Fischer says her coaching philosophy—her values—are the same: Build a fundamentally sound program, do things for the right reason, do them the right way, learn from your mistakes, and do all of the above as a team. Fischer and associate head coach Tina Kramos, left, during a game this season. To help instill those values, Fischer has a seven-person staff with tons of experience, including associate head coach Tina Kramos (13 years’ experience), assistant coach Shannon Nicholson ’07, M.S. ’09 (five years), and volunteer coach Bill Dickson ’54, M.S.E. ’57 (15 years). After the season ends this spring, recruiting season gets underway throughout the summer and fall. Fischer does get a little downtime around the holiday break when the fall mini-season wraps up. In what little free time she has, Fischer likes to travel, and relishes international trips with her team. “This is my home. This is absolutely my family. There’s no other place I’d want to be,” Fischer said.